Two wheels, some slabs of metal, a chain and an uncomfortable chair. What could be more simple to make then the common bicycle? Well motivated in part by a decision to begin cycling to work, I decided to delve into the history books to discover who invented the world’s first bicycle. So how old is the bicycle and where did it come from? According to some, this is the first ever sketch of a bicycle, created in the 1400s. If only this were a simple question to answer! Nowadays most people would argue that the bicycle was invented in the 1800s but others maintain that its roots can be traced back centuries earlier. Such people argue that the world’s first bicycle came from 1490s Italy, when Gian Giacomo Caprotti sketched out a rudimentary bicycle design. Captrotti was an Italian artist and pupil of Leonardo da Vinci, so it’s not beyond the realms of possibility that he could have created such a sketch. Not everyone argees. Since 1998, Hans-Erhard Lessing, a former Physics lecturer at the University of Ulm and a self-confessed bike fanatic, has argued that Caprotti’s sketch is in fact, a fraud. An opinion that hasn’t always proven popular, especially amongst Italian academics. Instead Lessing leans towards the more popular opinion that the bicycle stems from 1800s Germany. How did an eruption inadvertently create the bicycle? In 1815 Indonesian volcano Mount Tambora erupted. This was no small event. Nay this was an eruption that resulted in far flung places in Europe being affected (think the Icelandic Volcano incident but bigger). Indeed it was one of the worst ecological disasters the European continent has faced in modern history. So severe were the climatic aftereffects of the eruption that the year 1816 is commonly referred to in European history as the year without a summer. For people in Germany, the effects from the climate change were particularly bad. Harvests failed, people starved and horses, the main means of transportation at the time, began to die en masse. It was the disruption caused by the volcano that many believe motivated Baron Karl von Drais, a German civil servant from Baden, to invent the world’s first bicycle. Witnessing the distress and destruction around him, Baron von Drais got to work on finding some form of a solution. Luckily for bike enthusiasts around the world, he soon found something. Within a year of the crop failure, Drais had invented what he dubbed a Laufmaschine (‘running machine’ in German). A Laufmaschine was, in common parlance, a bicycle. Weighing over 20 kilograms, the Laufmaschine was heavy. Very heavy. It was difficult to manoeuvre, what’s more it was difficult to ride. The Laufmaschine was a pedal-less bicycle, meaning that users were required to push themselves forward using their feet (Flintstones style!). What the Laufmaschine lacked in practicality, it made up for with speed. On its maiden voyage, the bicycle covered 13 kilometres in less than an hour. Unsurprisingly, the following year, 1818 saw the Baron obtain a patent for his Laufmaschine. The world’s first two-wheeled, steerable, human-propelled machine had been recorded. And while initially Drais’s invention was seen as more of a curiosity rather than a practical mode of transport, it wasn’t long before others began to copy and build upon the Baron’s work. The British are coming…The British and coming! By the early 1820s, the bicycle had made it’s way to England thanks in part to London based coach maker, Denis Johnson. Replacing the metal frame used by Drais in favour of a sleek wooden design, Johnson began to produce lighter weight (although not light!) bicycles with larger wheels at a cheaper cost. The new design, combined with a rather impressive advertising campaign by Johnson, briefly made bicycles the talk of London. The bike proved particularly popular with the higher echelons of English society, including the dandies. Sadly the bike’s popularity was not to last as cyclists began to notice that the bicycle wore out their boots and the police began to crack down on cyclists riding on sidewalks. Gone but not forgotten, the bicycle remained within the human conscious and at the fringes of society. All it needed was some tweaking and in the 1860s, the answer came in the form of gears and pedals (finally!). Once again we encounter the touchy nature of this subject as there is no one general consensus as to who actually invented the first bicycle with a fixed gear system. Some argue that German Karl Kech was the first to attach pedals and a fixed gear system to the bicycle in 1862. Others point to the 1866 US patent obtained by Frenchman Pierre Lallement as the birth of such a device. A third group point to Scotland were such devices were said to have been invented as early as the 1830s. Semantics aside, it was the 1860s that marked the birth or at least the increase in the popularity of the bicycle as we would know it. Whilst pedalling made cycling a much easier endeavour speed wise, it made cycling a far less comfortable experience. The ability to travel at much greater speeds had not been met with the creation of suspensions, comfortable seats or durable gears. It’s no wonder that bicycles in the 1870s were commonly referred to as ‘bone shakers’. And while the next forty years would see a series of innovations (some good, some not so good), it wasn’t until the outbreak of the First World War that the bicycle’s influence began to grow. Big wheels, brakes, better tires…cyclists were beginning to enjoy some relative comfort! From 1900 onwards the popularity of the bicycle began to increase even more. In Europe it became a viable means of transport, connecting people in ways that previously never seemed popular. Indeed, it is often said the rural Ireland became a much more accessible place in the early 1900s thanks to the bicycle. The roadster and its various iterations were the most popular models across Europe and elsewhere. That is what makes the history of the bicycle so interesting. The bicycle wasn’t just a Western good…it was found throughout the globe. 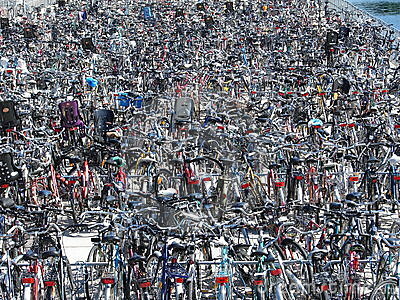 Remarkably in places like the People’s Republic of China, the bicycle became a government approved form of commuting. It became seen as a ‘must have’ for each citizen alongside a sewing machine and oddly a watch. It was only in the United States did the popularity of the bicycle begin to wane during this time period as the rise of the automobile impacted the number of people willing to cycle. A problem that still plagues Western society today. It wasn’t until the jogging boom in the 1960s that the United States began to look at cycling once more. Incredibly annual U.S. sales of adult bicycles doubled between 1960 and 1970, and doubled again between 1971 and 1975, the peak years of the adult cycling boom in the United States, eventually reaching nearly 17 million units. This interest helped contribute to the creation of other forms of bicycles such as BMX’s, Mountain Bikes, Hybrid Bikes and any other type of bike you can think of. It may be a recent invention but the bicycle has had a colourful and controversial past to say the least…and we haven’t even touched upon the world of competitive racing! That’s a story for another day.